The Original FLGenWeb Project begun in 1996 & incorporated as 501(c)3 not-for-profit in 2008, with over ten years of accumulated data contributions. St. Johns County was named for St. John the Baptist. St. Johns County and Escambia County were Florida's original two counties with the Suwannee River being the boundary between the two. The city of St. Augustine was founded by the Spanish admiral Pedro Menéndez de Avilés on September 8, 1565. Menéndez first sighted land on August 28, the feast day of Augustine of Hippo, and consequently named the settlement San Agustín. Martín de Argüelles was born here one year later in 1566, the first child of European ancestry to be born in what is now the continental United States. This came 21 years before the English settlement at Roanoke Island in Virginia Colony, and 42 years before the successful settlements of Santa Fe, New Mexico, and Jamestown, Virginia. In all the territory under the jurisdiction of the United States, only (European) settlements in Puerto Rico are older than St. Augustine, with the oldest being Caparra, founded in 1508, whose inhabitants relocated and founded San Juan, in 1521. In 1586 St. Augustine was attacked and burned by Sir Francis Drake. In 1668 it was plundered by pirates and most of the inhabitants were killed. In 1702 and 1740 it was unsuccessfully attacked by British forces from their new colonies in the Carolinas and Georgia. The most serious of these came in the latter year, when James Oglethorpe of Georgia allied himself with Ahaya the Cowkeeper, chief of the Alachua band of the Seminole tribe and conducted the Siege of St. Augustine during the War of Jenkin's Ear. In 1763, the Treaty of Paris ended the French and Indian War and gave Florida and St. Augustine to the British, an acquisition the British had been unable to take by force and keep due to the strong fort there. St. Augustine came under British rule and served as a Loyalist colony during the American Revolutionary War. The Treaty of Paris in 1783 gave the American colonies north of Florida their independence, and ceded Florida to Spain in recognition of Spanish efforts on behalf of the American colonies during the war. Florida was under Spanish control again from 1784 to 1821. During this time, Spain was being invaded by Napoleon and was struggling to retain its colonies. Florida no longer held its past importance to Spain. The expanding United States, however, regarded Florida as vital to its interests. In 1821, the Adams-Onís Treaty peaceably turned the Spanish colonies in Florida and, with them, St. Augustine, over to the United States. Florida was a United States territory until 1845 when it became a U.S. state. In 1861, the American Civil War began and Florida seceded from the Union and joined the Confederacy. 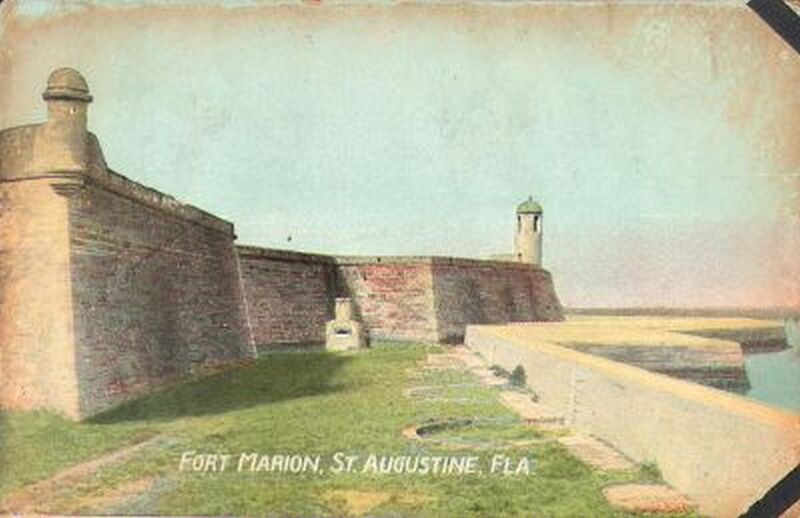 Days before Florida seceded, state troops took the fort at St. Augustine from a small Union garrison (January 7, 1861). However, federal troops loyal to the United States Government quickly reoccupied the city (March 11, 1862) and remained in control throughout the four-year-long war. In 1865, Florida rejoined the United States. Spanish Colonial era buildings still existing in the city include the fortress Castillo de San Marcos. The fortress successfully repelled the British attacks of the 18th century, served as a prison for the Native American leader Osceola in 1837, and was occupied by Union troops during the American Civil War. It was removed from the Army's active duty rolls in 1900 after 205 years of service under five different flags. It is now the Castillo de San Marcos National Monument. In the late 19th century the railroad came to town, and led by northeastern industrialist Henry Flagler, St. Augustine became a winter resort for the very wealthy. A number of mansions and palatial grand hotels of this era still exist, some converted to other use, such as housing parts of Flagler College and museums. Flagler went on to develop much more of Florida's east coast, including his Florida East Coast Railway which eventually reached Key West in 1912. The city is a popular tourist attraction, for the rich Spanish Colonial Revival Style architectural heritage as well as elite 19th century architecture. In 1938 the theme park Marineland opened just south of St. Augustine, becoming one of Florida's first themed parks and setting the stage for the development of this industry in the following decades. The city is also one terminus of the Old Spanish Trail, which in the 1920's linked St. Augustine, Florida, to San Diego, California with 3000 miles of roadways.